I did these a couple of weeks ago and had to erase them after the weekend cos I’m not allowed to wear my fancy art work to the office (bummer, right?) before we get started, let me warn you that this could be pretty messy. Either you put clear tape around your fingers or you just clean up with polish remover afterwards. So then, let’s get started! 1. For my base, I used a duochrome color that has dark blue and dark green reflects. You can use a plain black, but the duochrome adds dimension to it. 2. Next, take your Make-up sponge and dip into some of the orange polish. Apply over your nails in a diagonal direction in stippling motions. 3. Take another end of that sponge and dip into the blue polish and apply as you have done with the orange polish. 4. On another end of your make-up sponge, dip into the pink and apply randomly over your orange and blue diagonal. 5. Still with your sponge, take some of the green polish and stipple over the end of the diagonal. 6. 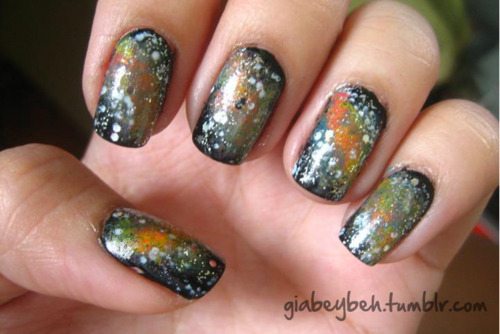 Next, take your toothpick and apply some random white dots on the plain sides of the nail and some over the diagonal. 7. Let the manicure sit for a while and then apply your silver glitter. 8. Finally, a coat of clear polish for shine and protection for the design. I hope you enjoy this design as much as I did! Medyo nahilo lang naman ako reading how much I needed for this. Pwede bang ikaw na lang gumawa? uuwi ako para lang dyan. Pwedeng pwede. Ano bang brand mo? Have you tried Butter? Those things are amazing. haha. I heard!!! But i haven’t tried yet kase wala dito.